It was a 1-1 breakeven night last night. We backed two solid, performing teams. One performed. One did not. The Kings did what they had to do against the Habs, although they left it late. They had to come from behind and it took till the 3rd for the goals to flow. Feel bad for Montoya after that surge at the end. It’s interesting as watching that one at the end I felt like the Habs would turn it around their next game. However they’re still on the road trip and are going up against the Ducks next. Tricky one that – it’s just one of those things where my gut says Montreal. The Blackhawks – ugh. I don’t think there’s a team in the NHL that comes close to rivaling them for “inability to show up”. That was just such a frustrating game to watch as the Blues ran all over them. Hawks only got 4 goals on net in each of the first two periods. I said yesterday too that I was going to stay away from that one. I just had a gut feeling that the Hawks wouldn’t show up here or that it’d be a tight one. However the odds were good enough to make me take a second look at it and stats wise I felt it was the right pick. Anyway it happens – very difficult to predict when a team isn’t going to show up like that. Despite a busy card of NHL there are no tips tonight. We’ve looked at everything and there’s not anything we feel very strongly about or agree on. Best to just take the night off rather than force something. 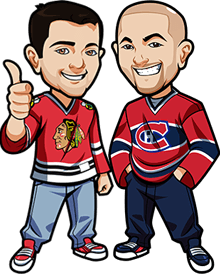 be sure to check our comments though because there are lots of great people always posting their picks there and that should give you some NHL action. That’s at the bottom of the page below the OHL/KHL Tips. Flyers To Win: I initially liked the Flyers to win but a lot of that is based on their home performances so far. It’s too small a sample size, and the Preds are always tough to predict. Islanders/Rangers Over 5.5: This was the closest one to a pick. Scott liked it. After looking at everything I just couldn’t go with it though. The Islanders offensive performances have disappointed me and even in a big game like this I’m not sure they’re able to get the goals. But this was the closest one to a pick. Jackets to Win: We both liked this but the odds weren’t there considering they’re taking on a feisty and strong Tampa team whose offense are rocking. OIlers/Hawks Over 6: Scott liked this but I’ve watched every single Oilers game this season and their offense concerns me. I’ll wait till they get clicking again before looking at tips like this. Stars to Win: This was one I was going to take if the odds were good. Stars are the better team if inconsistent and some struggles on the road. But the odds aren’t good. OHL Betting Tips (6-1, +3u): Niagara IceDogs in regulation at 1.60 odds. KHL Betting Tips (13-8, +3.70u): Amur Khabarovsk at 2.45 odds.